The ultimate in Italian comfort food. Growing up, our extended family would gather at my Grandma’s every Sunday for the traditional Sunday dinner (which, in contrast to common nomenclature, is actually eaten by Italians at what is typically lunchtime). While there was always some type of meat on the table, some potatoes and vegetables, the star of dinner was always pasta. 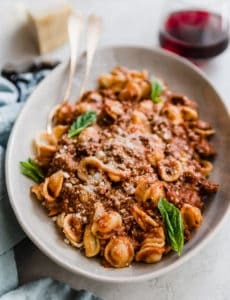 It may have been ravioli, gnocchi, manicotti, lasagna, spaghetti (all homemade, of course), or some other variation of pasta, but without a doubt, you could always count on a great pasta dish. It feels warm, comfortable, cozy, and just like home. 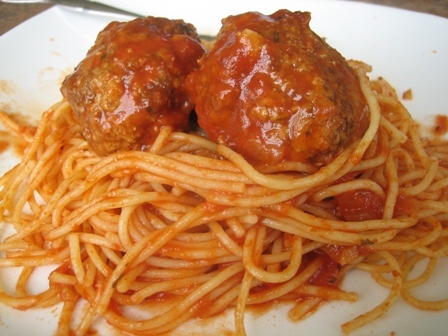 And for that reason I am submitting my spaghetti and meatballs into What’s For Lunch Honey’s Monthly Mingle Comfort Foods blog event. Meeta asked fellow bloggers to celebrate the foods that pick us up when we are down, warms us when we are feeling lost, and blurs out the bad mood. 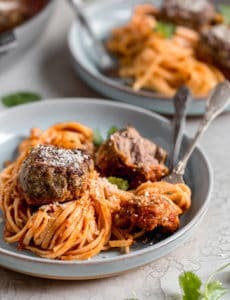 This is what spaghetti and meatballs represent in my house… the warmth of family, memories of childhood, and a connection to my heritage. I hope you enjoy these simple and classic recipes. This spaghetti sauce is so much better than anything you'll get n a jar! 1. To make the Sauce: Saute onion and garlic in olive oil over medium-low heat until onion is tender. 2. Add tomato sauce, tomato puree, parsley, basil, water, salt, and sugar. 3. Stir and lower heat to a slow simmer. This best if it's left to simmer for at least 2 hours. 4. To make the Meatballs: Preheat oven to 350. 5. Combine 1/4 cup of bread crumbs with milk and let soak for 10 minutes. Combine with all remaining ingredients and shape into balls. 6. Cook for 30 minutes and then add to sauce. If you want to cook them the whole way in the oven, cook for 40-45 minutes, depending on size. Could you waterbath can the sauce? Hi Jen, I can’t recommend doing any long term storage with this sauce, as I have no idea if it would be safe. This is a really dumb question, but exactly how much water is added to the sauce? Hi Helen, It is not measured, it is literally a swish of water around the cans to loosen any additional sauce/puree. This recipe is amazing, every time I make it I wonder if any sauce will make it to the table since everyone sneaks in and dips bread into the simmering sauce before it’s served, and by everyone I mean me too. Hey Michelle! 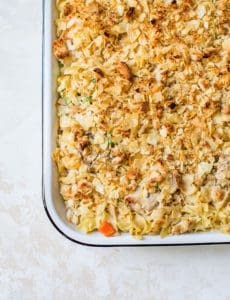 I’d love to make these for my weekly Sunday Supper with my brother and his family. If you do the meatballs for only 30 minutes in the oven, then finish them in the sauce – how long should the meatballs be in the sauce for them to finish cooking? (Dumb question I know). Hi Heather, The meatballs should be about done in the oven, putting them in the sauce helps meld the flavors. I would leave them in at least an hour. Can you make them ahead of time and freeze? Michelle–I am SO happy to see your meatballs have Romano cheese in them. My grandma made them in a similar way and if they don’t have Romano, they just aren’t “right”–don’t smell or taste like hers. My cousin who lived near to Grandma went over and watched and measured her “handful” of this and that and now we think we have a pretty good version of what she did. If only we had written down other recipes that we now crave! At any rate, she used a mix of meat–beef, pork and veal–and fresh bread that she tore into pieces, soaked in milk, then wrung out and added to the meat mix. I’m sure yours are delicious! Thank you very much for recipe, Michelle! I made the meatballs for the second time tonight. This time I added a couple of tablespoons of minced onion, doubled the minced and powdered garlic, and increased the salt to yield even more of a flavorful blast. With these changes, this is now my favorite meatball recipe ever! Thanks again! Meatballs and sauce simmering away on the stove now. They are PHENOMENAL. So, so, so good. The only change I made was to use crushed up croutons instead of bread crumbs, and I fried up the meatballs in some bacon grease before adding them to the sauce. This is a keeper recipe for sure. how big do you make your meatballs for the cooking time you suggested? i’m definitely trying this recipe this week! Hi Emily, I use a large cookie scoop, which holds 3-4 tablespoons. Why do you only soak half the bread crumbs in milk? What do you do with the other 1/4 cup of crumbs? I am making this now and really looking forward to dinner tonight! I found your website and the 150 fall recipes look fantastic! I want to try them all. Thanks! Hi Jenny, It’s for texture. The other 1/4 cup of crumbs gets mixed in with all of the other ingredients. Enjoy! this was hands down the best spaghetti sauce and meatballs ive ever had. I was so impressed with the flavors, its better than any jar sauce out there! thank you so much for sharing this recipe, youre a rockstar. I tried the sauce recipe last night, my roommate had her meatball recipe that she just HAD to make, so I will try yours in the future. But the sauce..was amazing (I did add a tiny splash of white wine). Going into my recipe bank for sure!